Based on the English dish toad-in-a-hole, this is nothing more than a savory muffin. Read more about make-ahead kids' lunches in the article "Snack time." Preheat oven to 375 degrees and grease (or line with paper cups) a 12-cup muffin tin. In a medium bowl, combine the flour, cornmeal, baking powder, and salt. In the bowl of a stand mixer, combine the butter and light brown sugar and mix 1 minute or until light and fluffy. Add the milk, eggs, and corn, and mix on low speed until combined. Slowly add the flour mixture and mix until just combined. 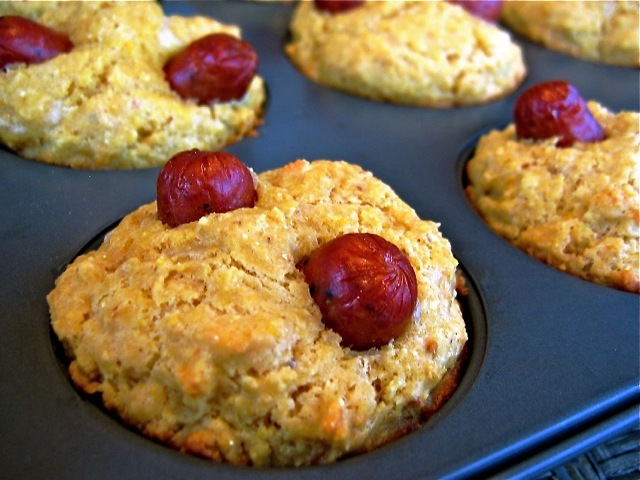 Spoon mixture into prepared muffin tin and press a piece of sausage into the center of each muffin. Bake 15 to 20 minutes, or until the muffins are golden-brown and a toothpick inserted into their centers comes out clean. Let cool slightly before serving. If there are any leftover muffins, wrap them well in plastic and refrigerate up to three days. If you use fresh sausage rather than precooked, you’ll have to cook the sausage before adding it to the muffin batter. Large turkey sausage works better than breakfast links, but either kind will do; if using smaller links, simply press several smaller pieces into each muffin. This recipe also works with hot dogs; simply cut four hot dogs into 1-inch pieces and press them into each muffin.